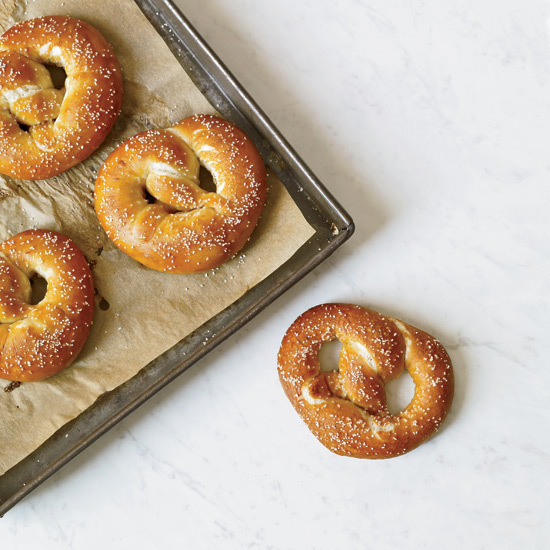 Here, 4 recipes for pretzels so good you'll want to protect them—from anyone else who might want to eat them. From now on, only pretzels baked in Bavaria can be called Bayerische breze (Bavarian pretzel) according to the EU, which has added pretzels baked in that German state to its "protected origins" list. Here, 4 recipes for pretzels so good you'll want to protect them—from anyone else who might want to eat them. Mimic the delicious Bavarian pretzel with this fantastic, chewy version from chef Hans Röckenwagner. Grant Achatz's slightly sweet pretzels with flaky salt are terrific on their own or with mustard. These pretzels are boiled and then baked, which gives them a chewy, bagel-like interior. A great way to use leftover pretzels, this clever dish is a fun twist on traditional bread dumplings.